If you live in Denver Colorado,the raccoon is one of the most familiar masked bandits! It is not uncommon to have a raccoon living in the attic, raccoon in the roof or chimney, or raccoon living in your garage this time of year... Raccoons will look for places to make a nice warm nest for the cold winter months. Raccoons nesting in your Denver home can cause alot of damage. Raccoons can destroy homes by ripping holes in the roofs shingles, digging holes under the porch, and totally destroying insulation. Not only shredding it up, but urinating and causing your whole house to smell and be contaminated with possible parasites and germs. We at EnviroCritter can remove soiled insulation, and replace with new, one of our many services in Denver Raccoon Removal. Baby Raccoons make chattering noises that are heard when they are hungry and cold. Mama raccoons make growling sounds. If you hear such noises in your fireplace or chimney, attic, or roof, and suspect you may have a family of raccoons, the Denver animal control technitions at EnviroCritter can assist you with your animal problem. After trapping the adult mother raccoon they can tell if she is still nursing her young. EnviroCritter will then safely remove the baby raccoons and relocate them together if possible. You definately don't want to start your fireplace until you are certain all the babies have been rescued. 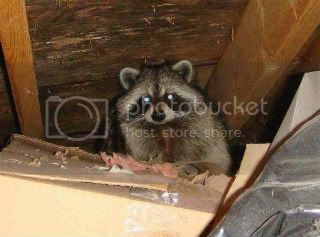 If you should hear scratching noises in the walls and ceiling, chances are you have a raccoon living in the attic. It is in your best interest to hire a professional Denver wildlife trapper to trap and relocate the Raccoons. Raccoons may be cute, but they are not cuddly! Raccoons have very sharp teeth and some do carry rabies. You should never see a raccoon out in the daytime. They are nocturnal animals who sleep in the day. If they are out during the day, chances are they are sick and more dangerous. We do not reccomend approaching the wild animal. Call EnviroCritter imediately at (720)295-7378 to safely remove the raccoon. Raccoons love tipping over garbage cans! Never leave garbage cans open outside your home. Metal garbage cans and lids are reccomended, but not raccoon proof. You should not leave your pets food accessible to hungry raccoons. Raccoons eat everything from mice, fish, frogs, garden fruits, and even dig through compost piles. If you should want to trap raccoons yourself, never use foods appealing to the family cat! Marshmallows, grapes, and fruit with peanut butter will work well. It is always better to hire a trained professional to trap and remove the raccoons from your Denver home. If you need help with trapping and removing nuisance raccoons.Call your Denver Animal Control Professionals Today at (720)295-7378 we at EnviroCritter will be happy to assist you. We have 9 years experience and calls of this sort are common.